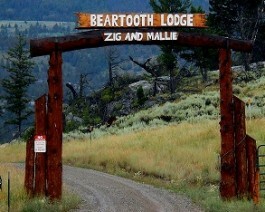 The Beartooth Lodge and Cabins are located just 22 miles from the Northeast Entrance of Yellowstone National Park, nestled in a valley surrounded by National Forest and pristine wilderness areas. The Chief Joseph Scenic Byway runs through it and five miles to the north intersects with the Beartooth All American Road. The Clark’s Fork of the Yellowstone River borders the property on the north and Crandall Creek on the southeast, both are outstanding blue ribbon trout fishing streams! Listen to the river run at night as it puts you to sleep. In the morning, sit on the covered porch with your coffee and enjoy an amazing private view of the Clarks Fork River and the abundant area wildlife. Open May-November. No Pets.